Hello Guys How are you doing today? I'm good. Well I'm so sorry that I wasn't send you another story of my mission last week it's just because I was so busy exchanges with the AP but I will include 2 weeks of my missionary work here. OK? Actually we had a zone activity but we don't join them. We were in sister siti's house and we made a chocolate cake. Shared some scriptures, also we brought sister Irene to the lessons. They seem enjoy it. The next day we had district meeting and we also had Alexsonlly in the meeting. 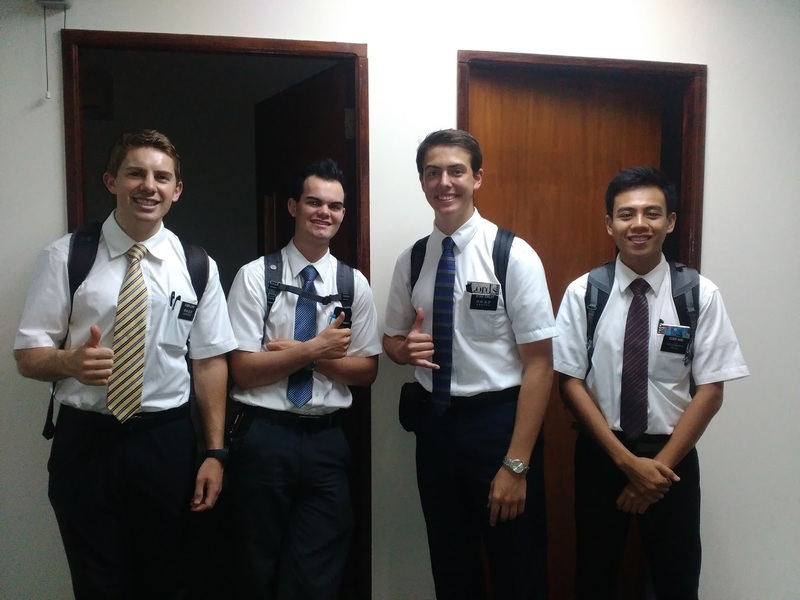 We contacting a lot that whole day and we had a dinner with James's family and that was so fun.The next day I was exchanges with elder Shirley and that was so wonderful story! We meet with sister Lihot in tthe town and I'm so happy because she gave me kacama (my favorito). We were contacting in PCM and when we walking to talk to people and we found 1 deaf people and he used sign language and since I know little bit of sign language but that was in ASL and I was able to get him and we'll share with him another day. Elder Shirley seems wanted to learn about Sign Language. That's fun huh? Brother Ethan brought us to SCR for dinner and he paid for us. We were in yi chen's house and I was able to shared a kaunti lang (little bit) ad that was chinglish (Chinese english). The exchanges were done at night. I'm so happy that I can became his companion for a day. That was fun! The next day I was companion with AP (Elder Spurier) and he's nice. We met with Rover's family and we had a good lesson with him. Elder Spurier taught me a lot. we also contacting filipino people and he said " You make me impressed on you because you can spoke tagalog with them". haha. The next day still excahnges with the elder Spurier and we talked a lot about missionary work. He like to pulled out his hand and shake with another people hand. We talked with filipino girl named melody and she felt the spirit. The spirit was very strong and she cried. Exchanges back with elder Hadley at evening and we went to cosmos places, I taught him in sign language because my companion wasn't able to use any SL but he understand the sign, I guess because the sign wasn't hard to understand it. And we had a dinner in KFC and after that we went to sister Ensuma's house and had a great lessons with them. We don't have any english class because allof our student celebrate chinese new year even though for not chinese. Ayoo. On sunday, we had cosmas who is deaf came to the church and he likes it a lot. After that we went to Rover's house and taught them about endure to the end. After that we went to brother James's house and they seem had desires to learn more about Christ and I love them a lot. Brother Alexsonlly was coming with us in the lesson. Last week, I still stay in this area. I won't be transfer to another area in the short time. I know that will happen to me. Sometimes I hate it but somehow I love it. Again we went to brother James house and taught them about 10 commandment. The next day we were in the church because it was Tuesday and we had district meeting and elder Lloyd and elder Shirley show us the way to get the potential investigators house. One of the places that they show us is deaf person. Now we had 2 deaf person. We waiting for brother Cosmas and we waiting for him like almost an hour and when we want to go to sister Dara's house and brother Cosmas just showed up and we need to teach him and we'll late for next meeting with sister Dara's and family. We were biking like 8 minutes for more than 6 miles and without stop. That was from church to sister Dara's house. Sister Dara sent us to old SKS and we met with Nelson and he is deaf too. Long conversation with him and we get home at 10 pm. The next day we caught sister Lily's in camera and she was so silly. at night we went to funfair to get some food. On Friday we met with sister Lily and family and we had a fun game. Scriptures game. They love it so much. We had so much rejected this week plus chinese new year almost 70% of members and our investigators back to kampung. Apu! We drop very nice families but they don't want to change their church and I really love them because I can see if they want to come to our church they will be more happy. Yesterday another sad day which another big family told us they probably don't want to learn anymore but they goes so far,they keep the commandment including word of wisdom but they are not coming to the church, that made me little bit sad. Talking with them and I felt so in love with them. Somehow I think I need to be more specific pray and with real intend. That is all for last two weeks and see you again next week.